As the Apple v. Samsung trial continues in San Jose, California, Apple SVP of Worldwide Marketing Phil Schiller testified on Thursday, explaining the risks involved in developing and bringing to market a new device like the iPhone. 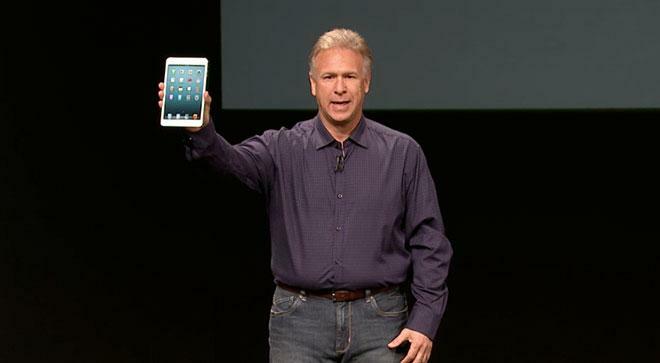 Apple SVP of Worldwide Marketing Phil Schiller revealing the first-generation iPad mini. According to multiple in-court reports from various publications, Thursday's Apple v. Samsung proceedings were quite dry, with little information coming to light that had not already aired in the landmark jury trial last year. Apple and Samsung are disputing roughly $400 million in damages U.S. District Court Judge Lucy Koh vacated in March after finding inaccuracies in the jury's award calculations. The current trial pertains to these damages, with Apple seeking some $380 million, while Samsung claims the correct amount is closer to $52 million. As for Schiller's testimony, CNET reports the Apple executive took the stand near the end of Thursday's session, with only minutes to introduce himself and quickly describe the importance of the iPhone. "There were huge risks," Schiller said about the original iPhone. "We had a saying inside the company that it was a 'bet-the-company' product. We were starting to do well again in iPod. Then here we're going to invest all these resources, financial as well as people, in creating this product." He went on to say that now "almost everyone" at Apple works on the iPhone project in some capacity. Apple argues, as it did in the 2012 jury trial, that Samsung infringed on certain utility and design patents with its smartphone and tablet lineup. In the retrial, Apple is asserting five patents against 13 Samsung devices. It will be up to the jury to decide what damages should be awarded to the Cupertino company. The case continues tomorrow and is scheduled to run into next week, with deliberations to follow.